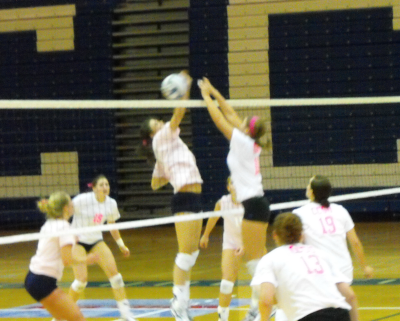 NEW BRITAIN, CT- The Quinnipiac Bobcats and Central Connecticut State University Blue Devils did volleybattle in New Britain Saturday afternoon, and also honored the Dig Pink initiative to collect donations and support in the fight against Breast Cancer. In the end Central would take a 3 to 0 win however it was a hard fought match set by set and point by point between NEC foes. Linda Sagnelli’s Blue Devils and Robin Sparks’ Bobcats gave the crowd a lot to talk about throughout the afternoon. It was also the largest crowd I had seen at a CCSU volleyball game in my time attending them. It was bolstered by the men’s soccer team and elements of the men’s football team. The soccer team especially was loud and supportive including breaking into chants of “ole” during a back and forth. The fan support for CCSU was by far the most I had seen for a team since Quinnipiac hosted their tournament in September. The Bobcats were bolstered by their one man cheerleading squad who arrived hats in hand or should I say box and gleefully did vocal battle with the Central masses. This culminated many of the central fan base crying “Change your hat!” which he obliged throwing a viking helmet on. Prior to the game, CCSU senior Amanda Bayer was presented with an award for achieving the mark of most assists in CCSU history. Set 1 went Central Connecticut’s way as the Blue Devils won 25-18. Highlights for CCSU included a great save by Bayer setting up an eventual kill just in bounds, later, Emily Cochran spiked a ball to defense’s left corner, the two teams would exchange points for awhile, but Jamie Rademacher then uncorked a blast to regain a lead, later Sara DeLacey whipped the ball in, Cochran crushed an attack not long after, and DeLacey came up big again, as did Cochran with a rocket, Quinnipiac climbed back into it, but Central started closing the door with a Cochran missile just in bounds, followed by a great defensive play where Kaitlin Petrella and a teammate dived to the floor, narrowly keeping the ball from hitting the hardwood, this set up a point soon afterward, and another follow, Cochran than spiked through the block, and later she put down an errant Quinnipiac pass, Danielle Gasser who had been serving since point nineteen then service up an ace to take the set. For QU, Kayla Lawler served up an ace early on, and Stephanie Biediger added a kill off the defenders and out of play, Amanda Armstrong set the ball over for a point, and later more would follow during the back and forth, Olivia Grattan added an attack that was not returned, and later Kelby Carey did as well, Armstrong had a wicked kill to take a lead before Central went on a big run, but Taylor Payne broke the run with a hard kill in, and a running jumping kill not long after, Armstrong pulled the team with a spike to a back gap, and a pair of CCSU miscues put them back in the lead, though Central would then roll with unanswered points for the set win. In Set 2 CCSU would prevail by the closer 25 to 21. And for the visiting Bobcats while Central was building a lead, Lawler had a nice defensive save that did eventually lead to a point, Armstrong sent a blast through the blockers, and Grattan had a block not long after, a great save by Tracy Wright during a long rally did keep things alive and CCSU did commit an attack error to result in points, Grattan had a kill soon after, as did Carey twice, including hammering her attack through the blockers, she added a kill to the corner, later on Payne tapped the ball over the blockers to pull the team within 1, and Grattan’s kill through the block did so again. In the closing moments of the set, Carey’s solo black and her tandem with Armstrong kept the team alive for a few more points. Set 3 opened with Central seeming to take control, but a late charge from Quinnipiac made it interesting until the final 25-21 score was notched for the Blue Devils. Highlights for the blue and white included King’s smash to open things up, followed by DeLacey’s kill, later Cochran had a block, and a smash to the back gap, King struck again, and Petrella sent an ace just in bounds, to be followed by DeLacey receiving a set and just unleashing a massive spike with it, followed by another Petrella ace. King and Cochran added successive kills not long afterward, and Vaughan tapped the ball over the defenders to give the team an 18-9 lead. A good diving save by King kept the ball in play long enough fro a QU attack error and another point followed, but then QU started a brief comeback picking up several points at a time, the score was soon 23-16, and during a long rally, both Bayer and Petrella had key saves but QU picked up another point, with the gap narrowing though to 24-21. After a time out though DeLacey ended it to crowd’s delight. For the Bobcats a save by Lawler early on did not prevent a Central point, Armstrong pounced on a Central overpass, Grattan launched a rocket kill from the net, and later added a kill off the defenders and out of bounds, Payne had a kill of her own, and later Wright added an ace, immediately followed by Biediger and Grattan sharing a block. During the brief comeback Biediger sent a kill in to cut the lead to seven, and thanks in part to a save by Logan Riker the team kept the ball in play long enough o pick up another point, Carey whapped a ball off the defenders, and was also responsible for the team’s 21ist point with her kill.